HBO didn't make fans wait long for a little bit more Game of Thrones season 8 footage. Anyone who has been on social media at all over the course of the last 24 hours is surely aware that the beloved HBO fantasy series has finally returned for its final run of episodes. The network took their time making this final season and it's been more than a year and a half since new action from the world of Westeros arrived. Now, we're off and running and episode 2 has just been given a dramatic preview. 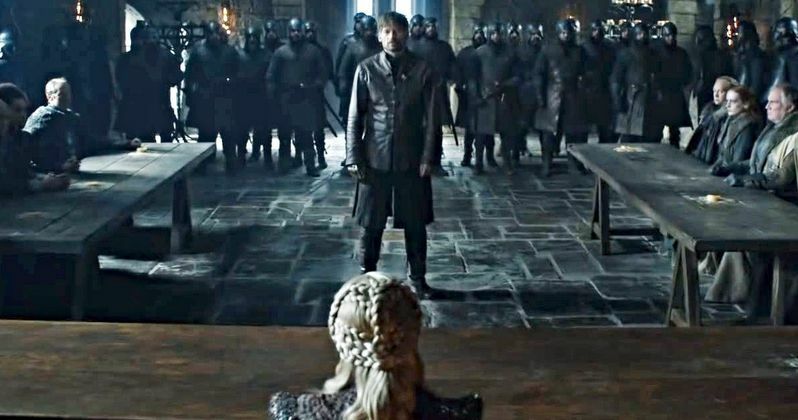 The premium cable network revealed the new trailer for episode 2 of Game of Thrones final season just after the season premiere debuted. The teaser kicks off with some dramatic character moments before digging into some quick-cut action. It's just enough to get fans amped up for the next episode while also not giving too much away. Daenerys has this to say in the brief teaser. "When I was a child, my brother would tell me a bedtime story about the man that murdered our father. And all the things we would do to that man." It's a bittersweet time for fans of the series. On the one hand, things are coming to an end. With only six episodes in season 8 (long episodes, to be sure), that end is going to be here before we know it. For now though, it's mostly just sweet as fans are riding very high from the season 8 premiere. The question is, what do creators David Benioff and D.B. Weiss have in store for us in the weeks to come? Benioff and Weiss surpassed the novels by creator George R.R. Martin some time ago and, though they've consulted with the author, it's largely up to them to decide how things end. Who will ultimately win the deadly Game of Thrones? Can they possibly bring things to a close in a satisfying way? That's a tall order. Benioff and Weiss also serve as directors for the final season, alongside David Nutter and Miguel Sapochnik. The duo also helped write the final run of episodes alongside Bryan Cogman and Dave Hill. So it's almost entirely in their hands. The series is produced by David Benioff, D.B. Weiss, Carolyn Strauss, Frank Doelger, Bernadette Caulfield, Bryan Cogman, Guymon Casady, Vince Gerardis and George R.R. Martin. It's worth noting that HBO did not reveal the title for the upcoming episode in this promo. Ever secretive until the time is right. They also released the brand new title sequence online, which got a major makeover for season 8. Game of Thrones returns for a new episode on Sunday, April 21. Be sure to check out the teaser trailer for episode 2, as well as the new title sequence, from the GameOfThrones YouTube channel below.